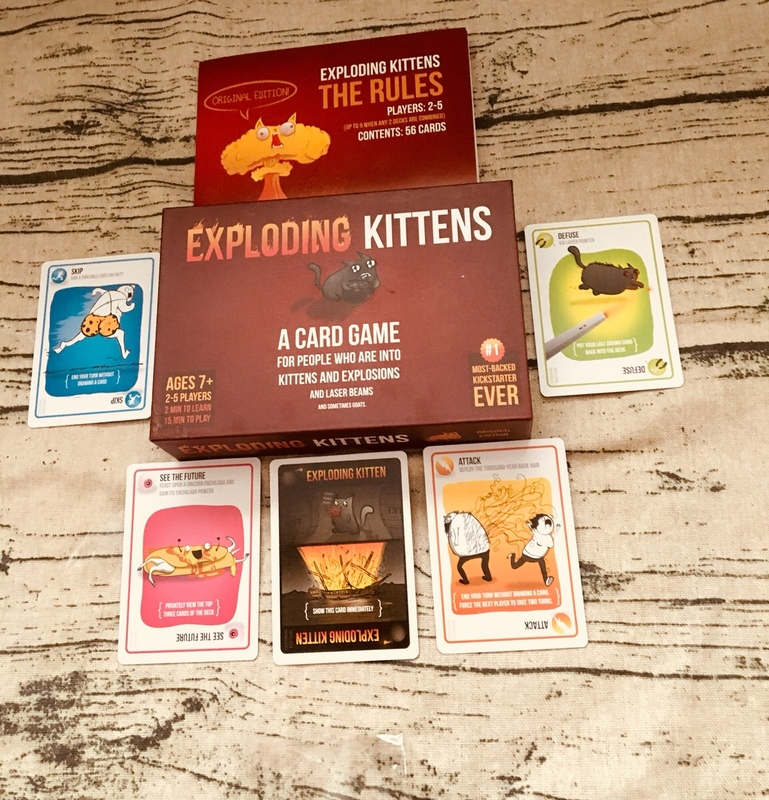 This is Exploding kittens, as part of our monthly blogger board game club collection. This is a game that has had me intrigued for months since hearing about it. I was so fascinated by it that I just had to request it. So what’s it all about? Well I’m afraid to disappoint you all but no one really explodes and nor do any kittens. It’s actually a card game with quite a few rules and different cards to get our heads round. As you can see, the cards are all designed in a quirky fun way. 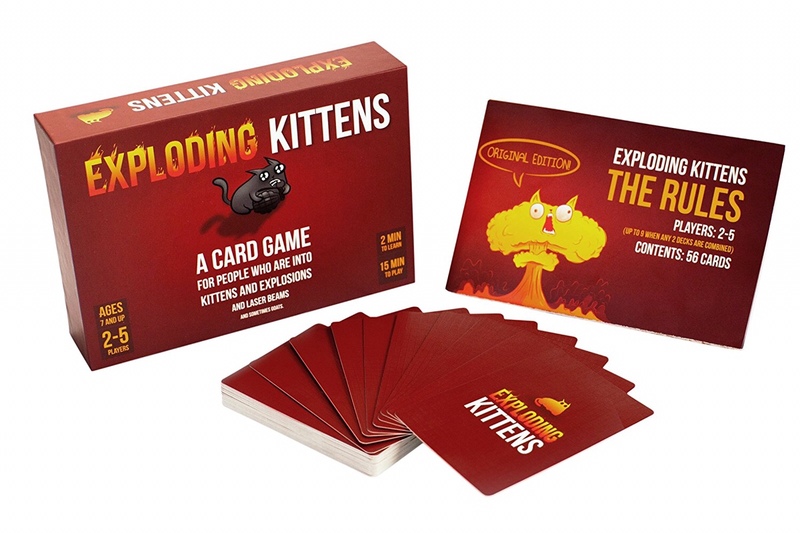 The object of the game is to try and avoid choosing that one card right in the middle; the exploding kitten! If you draw this card, you are essentially “dead” and game over! However you can escape the explosion if you have a diffuse card in your hand! There are many other playing cards in the pile including Nope, Attack, Favor, Skip, Shuffle and See the future all of which enable players to do different things to help them win. There are also powerless picture cards which don’t give any real benefit but need to be played in pairs. Each player starts with five cards and they can play as many cards as they wish on each turn. The turn ends with drawing a card from the draw pile after any played card instructions are followed. 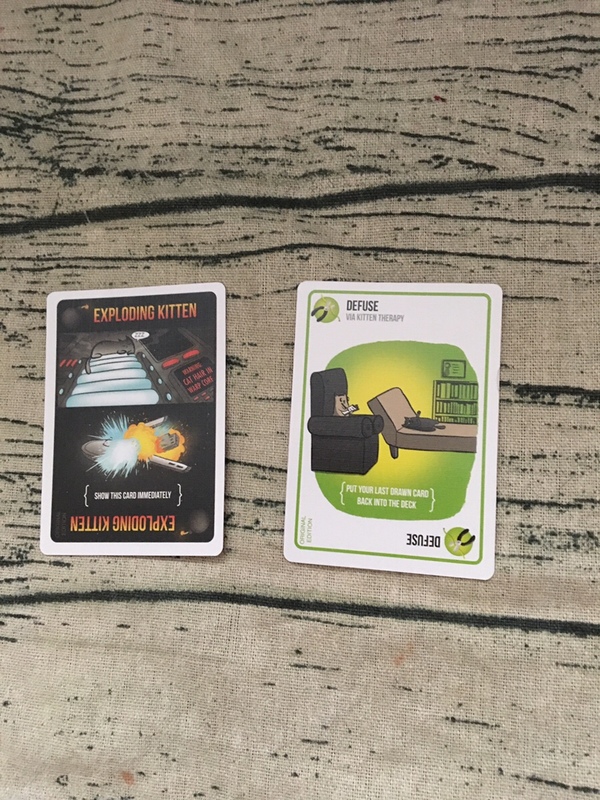 Play continues until someone draws an exploding kitten and does not have a diffuse card. It’s quite a complicated game to begin with, as working out what each card means takes a bit of understanding but it is quite a quick game and fun too. It can also be played via an app.